One of the newest additions to the treatment of Osteogenesis Imperfecta in Panama has been the physical therapy. "We train the muscles so they can take care of the joints", Anabel Fernandez said, physical therapist at the Hospital del Niño in Panama City. "We try to get stronger muscles to prevent fractures." Physical therapy has been available for OI patients in Panama in the last two years. Patients receiving physical therapy pay $3 per session, and ideally to be three sessions per week: Monday, Wednesday and Friday. Some patients receive help paying the Crystal Children Foundation. 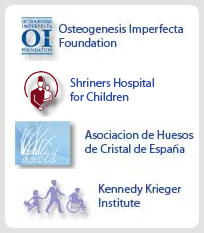 In Panama City is the only place where a patient can receive professional physical therapy, and because many patients with OI live outside the city, can not come to Children's Hospital for therapy. "Very few patients can receive treatment because most live far away and physical therapists in these areas are not trained,"Said Anabel. "If we teach them exercises to do at home exercises in the water or they can do in bed with and without weights." An electrical muscle stimulator is one of the key practices that can be used at home. If the patient can afford to buy the device $ 200, can be used to strengthen muscles without physically performing the exercises. "It helps with muscle-specific exercises and training,"Said Anabel. "You can use all the muscles to stimulate. We train parents to use and if the patient is too weak to exercise, then this is a good complement. " Anabel, other physical therapists, and other medical professionals to do more want to see treatment for patients. Unfortunately, due to OI patients are so susceptible to fractures, the window is limited when it comes to physical therapy. "If they have fractures, can not come to physical therapy,” Anabel said. "If they do not have fractures, come all the time until they meet around 16 years old. " Physical therapists have to modify treatments for patients with OI, because of their fragile condition. "We have to exercise that power without the use with any standard patient with a fracture,"Said Anabel. "It is also slower. We have to go slowly. He pushed me what the patient says. I wonder how they feel. " The sessions of physical therapy for patients with OI begin with exercises in the therapy pool. The pool has a machine that creates pressure in the water below the surface to give the patient a little resistance and help strengthen the muscles. "In the water, are freer to move and not a fracture,"Said Anabel. "Some patients can leave the water and exercise more, but some can only do physiotherapy in the water. " After the water therapy, patients go through the work on a treadmill and up and down a ladder specially designed. "The tape is used with a hydraulic suspension lift,” Anabel said. "The ladder helps them avoid having to use the full weight on legs. Because most patients have a fractured femur, This helps eliminate the stress they may cause. " Patients who can not walk, even with the support of the elevator, do exercises on a mat exercises designed to further that produces a result similar to the tape. "The staircase and the tape have a specific length and dimension, so if needed, You can use the space for the patient support of crutches or canes,"Said Anabel. "The stairs help strengthen the legs, hands, and balance. They receive instructions from us and going up and down 10 times, for example. " These exercises are only part of treatment to prevent fractures. The more physical therapy a patient can do, the more effective. If Panama legalized pamidronate, medicine for patients with OI, would then have stronger bones and could make a more physical. The combination could do wonders for the life of these children.